Knit 1 is so excited to be partnering with Brooklyn Tweed for a weekend of knitting, inspiration, and education! We couldn’t be more excited to welcome knitwear designer Emily Greene to Knit 1 for the weekend! We’re kicking off festivities with an exclusive trunk show and meet and greet with Emily, featuring her Brooklyn Tweed designs as well as pattern favorites in other yarns. All people registered for our Saturday event are welcome! and their perfect project bags! A Day with Brooklyn Tweed! Spend an inspirational day learning from yarn and knitting experts and see your favorite Brooklyn Tweed patterns in person! Our Day with Brooklyn Tweed will feature conversations and presentations from members of the Brooklyn Tweed team. As part of your registration you'll receive an event tote bag with a skein of Brooklyn Tweed Loft and an exclusive knitting project that we'll cast on and knit together. Also included: morning pastries and breakfast items, coffee, tea, juice, and soft drinks available all day, full lunch including pizza, sliders, mac and cheese, and sides provided by Big Bricks, and morning and afternoon snacks and refreshments, and a happy hour drink! Knit 1 will also be hosting an after hours party for those registrants who haven’t gotten enough after happy hour! Presenters include designer Emily Greene, knitter extraordinaire and knitting teacher Stephanie Elle, sewing pattern designer Jen Beeman of Grainline Studio, Brooklyn Tweed’s business developer Luigi Boccia, and Brooklyn Tweeds wholesale manager Kel Moore. Emily Greene: Confidently Tackle a Complex Garment Let’s focus on project planning to ensure an enjoyable process (with good results). Using Emily’s soon to be released Brooklyn Tweed Wool People 13 pattern, learn tips and skills that can be applied to any complex project. We'll cover swatching and gauge; yarn substitution, tracking yardage (avoiding yarn chicken! ); measuring yourself, selecting a size, reading a schematic, and basic pattern modifications; doing your homework: how to read a pattern and knit ‘in your head’, understanding garment construction and sequence, making notes; charts, shifting stitch patterns, and shaping ‘in pattern’; and managing everyone's favorite phrase, ‘AT THE SAME TIME’. Emily Greene, Jen Beeman, Stephanie Elle, and Allyson Dykhuizen: The Handmade Capsule Wardrobe In a forum style talk we’ll tackle the pros and cons of minimalist or capsule handmade wardrobe building. Brooklyn Tweed’s clean, classic aesthetic lends itself to creating a capsule style wardrobe. The forum will discuss planning pieces for a handmade minimalist wardrobe, incorporating both knitted and sewn garments, while also needing to cast on the newest shiny pattern popping up in your Instagram feed! As makers, how do we balance creating art and wearability? The forum will be moderated by Knit 1 owner Allyson Dykhuizen and include knitwear designer Emily Greene, sewing pattern maker and Grainline Studio founder Jen Beeman, and knitter and knitting teacher Stephanie Elle. Luigi Boccia: Brooklyn Tweed Makes It Work Domestic supply chain: unexciting words for a most exciting story. Brooklyn Tweed yarn is all-American, from growing to milling, spinning to dyeing. How does it all work, and what does it mean for you as a knitter? Kel Moore: Yarn Matters We have so many choices when it comes to yarn—woolen vs worsted spun, plied vs single, Merino vs. Rambouillet—and what we choose affects how we knit. Kel's primer on yarn will highlight the differences between many types of wool yarn, and what you need to know to become a better, more informed knitter. 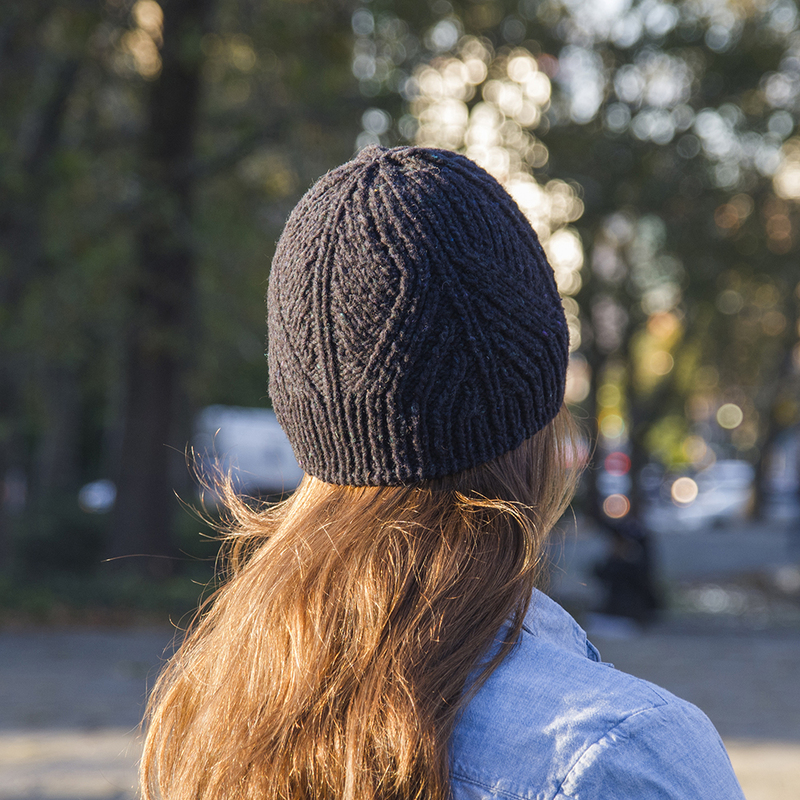 Learn to read charts and knit cables as you go boldly beyond the basics with this strikingly graphic cabled hat. Perfect for advanced beginner knitters who want to add to their skill set, as well as for intermediate knitters who want a quick but engaging project, Divide is unisex and quick to knit, but packed with skills and techniques to bring with you to your next project! You’ll learn how to tame the tubular cast-on, how to knit cables, and how to read and work from a chart. We’ll also cover how to cable *without* using a cable needle, and share special blocking and finishing tips for professional-looking hats. Skill level: Advanced beginner. Students must be able to knit, purl, cast on (long-tail method), knit in the round, and work basic decreases. Register for the class today! Please note all registrations are final. Gluten free and vegetarian options will be provided at all meals and snacks. Knit 1 is an accessible space, but our Saturday event space at Big Bricks is on the second floor and there is no elevator. We apologize for any inconvenience this may cause.